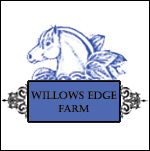 Willows Edge Farm is located in Bothell, WA just north of Seattle. They raise beautiful, quality Norwegian Fjord horses on their farm as well as offer riding lessons and Farm Camps during the summer months. The priority of the farm is to increase awareness of the majestic breed of Norwegian Fjord horse all while enjoying them to the fullest!